A memoirist spares no detail about her life with chronic liver disease. Jowett was in the eighth grade when her liver first acted up. Her “sick, jaundiced skin and glowing yellow eyes” were symptoms of what would eventually be diagnosed as autoimmune hepatitis, a debilitating condition she would battle well into adulthood. From a small town in Ontario to the University of Victoria to Arizona, Michigan, the Netherlands, and back to Canada, Jowett tried to live a normal life while managing her disease. She built relationships with gastroenterologists at each locale, had monthly blood tests, took lots of medication, struggled with her weight, and handled complicated health insurance issues, but for the most part, life was good. She got married, earned a nursing degree, and had a baby. It was during her second pregnancy that her disease took a dire turn, leading to incapacitating symptoms, hospitalization, and a harrowing birth. For the next six years, she endured worse and worse as she waited to become sick enough for a liver transplant. “My body and mind wanted to fight to live,” she says, “but with each illness I acquired, I felt my physical self become weaker and weaker.” Through it all, she never quit. When finally placed on the transplant list, she had just days to live. In her debut, Jowett doesn’t shy away from the tough stuff. With unabashed honesty, she describes gruesome details about what her body went through. Those unfamiliar with malfunctioning livers will be shocked to learn all the side effects, including an enlarged spleen, gallstones, and others; thankfully, Jowett aptly explains complicated medical procedures and biological workings. She doesn’t always focus on the disease, and many pages recount other anecdotes about her life. There are some interesting stories—how a hypnotist freed her of a needle phobia, life in Europe, etc.—but some details will likely be interesting only to loved ones. Readers learn, for example, that while Jowett was bedridden as a child, she mixed the colors wrong in a paint-by-number kit. Toward the end of the book, several chapters provide background on how organ donation works, with stories of other transplant recipients. 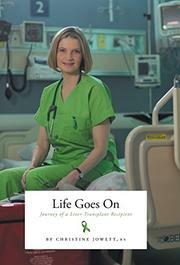 A frank, thorough read that proves the importance of organ donation.